This post isn’t about any visual design elements or graphic treatments. This is about good marketing design. Pizza Pie Cafe in Rexburg has a reader board out near their 2nd East entrance. The PPC message board often shares information about fundraisers and in-store specials. But that’s nothing new or unique. My favorite advertising design element at Pizza Pie Cafe are the funny sayings to lure unsuspecting Rexburgers through their doors: “Pizza, the other white meat”, “Let us help ruin your resolutions”, “Bad Roomies, we’re here for you.” The latest one that made me laugh–not a mere chuckle, but a full-on belly laugh when I was reminded and tried to repeat it to my wife later that day. This phrase had nothing to do with pizza, which isn’t new for PPC–they regularly have funny sayings about life and how they solve problems. The one that recently made me laugh so much was this: “I told her to TXT me when she got home. 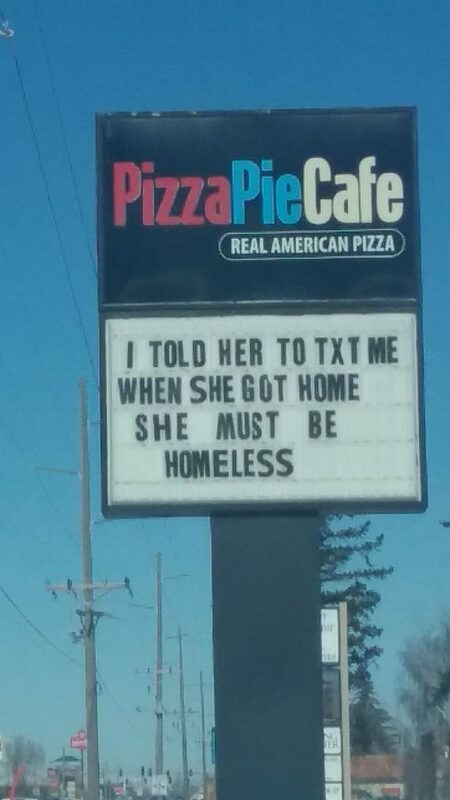 She must be homeless.” See? Funny stuff! Pizza Pie Cafe is doing a good thing. They add to the flavor of Rexburg in more than just their delicious pizza. They’re feeding our collective sense of humor, our need to laugh, and our inner-thirteen-year-old.